This tallith is of the highest quality, classic 100% wool. Choose your size and format of tzizit strings tye. Choosing no options will ship with standard tied ashkenaz tzizit. Usually most tallits are tied in the standard Ashkenaz. 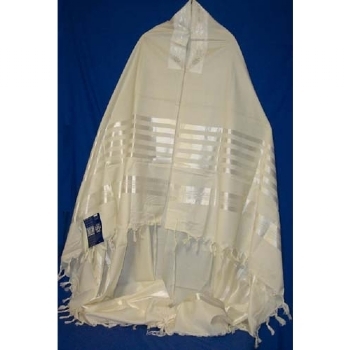 Neckband has a fancy design that blends with the tallit worn. Photo depicts Large Size 71/72″. Kosher by the strictist orthodox standards. Made in Israel.